There are always challenges whenever you move, right? Things always pop up, like trying to figure out how to arrange the furniture, which kitchen drawers will handle which utensils, how the closet is going to get organized… things like that. If you happen to have a food-obsessed Golden Retriever, then you need to add “how far back on the counter is far enough” to the list of things to do at a new house. I made this cake with the intention of sharing it with everyone for dessert on Sunday. I photographed it late Sunday morning, pushed it to the back of the counter on the island, and went upstairs to put Joseph down for a nap. When I came back down, the cake was in the same spot, but half of it had been decimated and there was a certain Golden Retriever (ahem, Einstein) that was huffing and puffing and looking all kinds of guilty. Needless to say, I apparently haven’t found a safe resting spot for food on the counter yet, and unfortunately, my husband and I (and Einstein, of course!) were the only two that got to taste how utterly amazing this cake is! 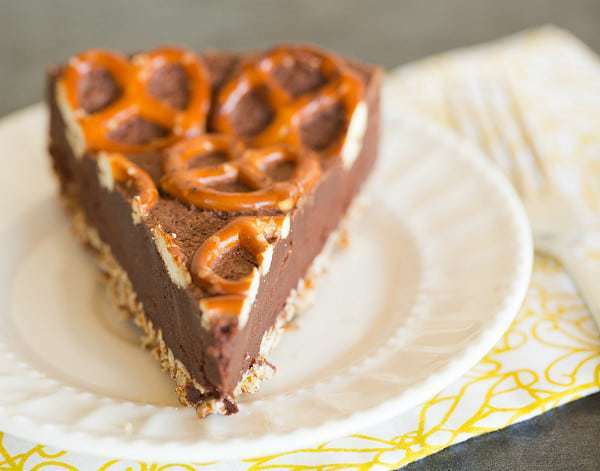 I saw a recipe in a recent Donna Hay magazine for a salted chocolate cake that had pretzels on top. I loved the idea, but thought, if we’re putting pretzels on top, then why not put them on the bottom, too?! I am such a sucker for the combination of sweet and salty flavors, which is why I can’t ever get enough of things like chocolate-covered pretzels or chocolate-covered popcorn. I stole the crust recipe from one of my favorite desserts – strawberry pretzel salad – which consists of crushed pretzels, sugar and melted butter. 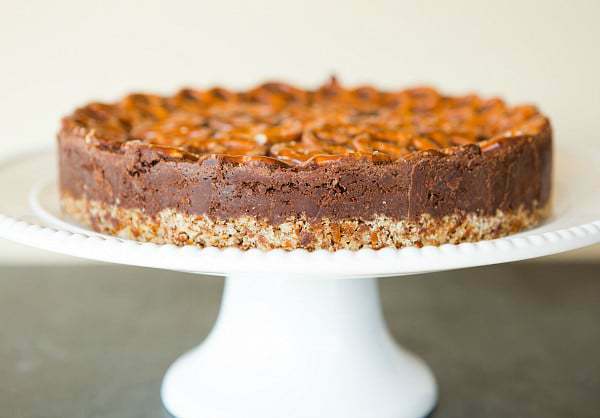 It’s a perfect base for the dark chocolate, truffle-like cake. 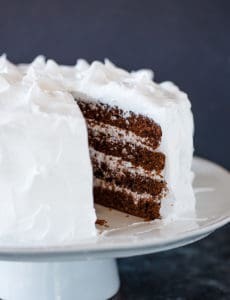 The addition of flaky sea salt into the actual cake gives it the perfect punch of salty/sweet balance. 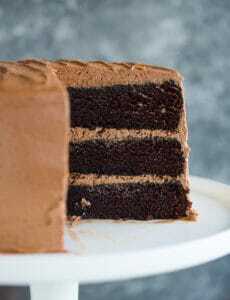 The chocolate cake itself isn’t quite as dense as a truffle filling, but is just as smooth and creamy. 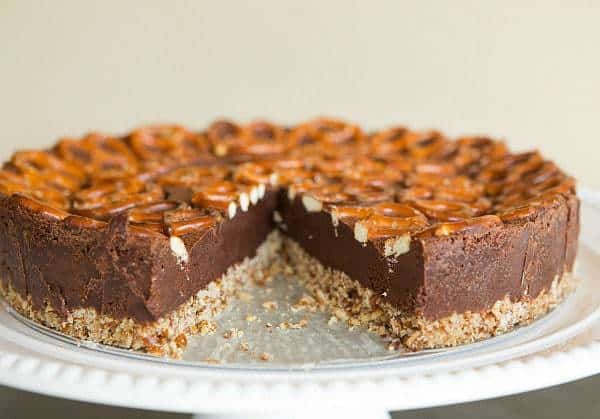 You could probably make this with semisweet chocolate if you prefer your chocolate a little bit sweeter, but I really do prefer the combination of dark chocolate and salt. This cake is such a fantastic combination of not only flavors, but also textures. If you’re a fan of sweet and salty, run into the kitchen and make this today! 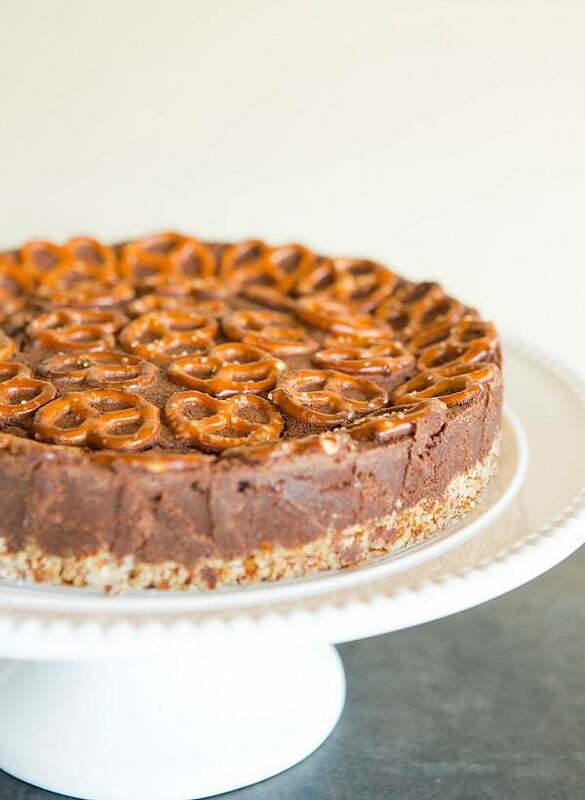 A crushed pretzel crust topped with a salted dark chocolate truffle-like filling, topped off with even more pretzels. Preheat oven to 350 degrees F. Lightly grease a 9-inch springform pan and line the bottom with parchment paper. 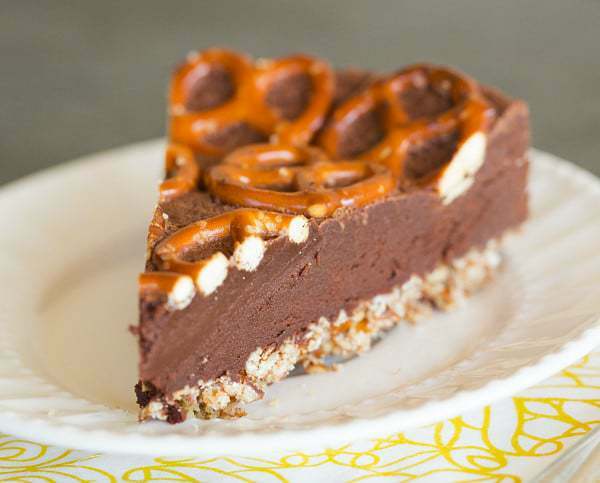 Make the Crust: In a medium bowl, mix together the pretzel crumbs, sugar and butter with a fork until evenly moistened. Press onto bottom of the prepared pan. Bake until golden brown and set, 10 to 15 minutes. Remove from the oven and set aside. 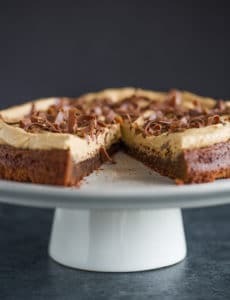 Make the Cake: Place the chocolate and butter in a large heatproof bowl over a saucepan of simmering water; stir occasionally until completely melted and smooth. Remove from the heat and set aside. Place the egg whites in the bowl of an electric mixer and, using a whisk attachment, whip the egg whites on medium speed until soft peaks form. Gradually add the sugar and whisk until the mixture is thick and glossy. Add the egg yolks and salt to the chocolate mixture and stir until thoroughly combined. Working in three batches, gently fold the egg white mixture into the chocolate mixture until just combined. Pour the batter into the prepared pan, smooth into an even layer, and arrange the pretzels on top. Bake until a toothpick inserted near the edge comes out clean and the center is just set, 25 to 35 minutes. Remove from the oven and let sit at room temperature for 10 minutes, then chill in the refrigerator for at least 3 hours before serving. 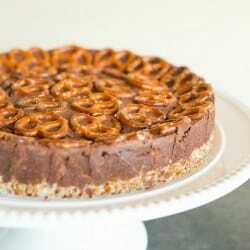 Can I Make in a tart pan? Also approx how many pretzels do I crush to get two cups? Hi Mary, I don’t think a tart pan will be high enough to hold all of the filling; a springform would be best. As for the pretzels, I didn’t count them, sorry! I would start with a couple handfuls and go from there. I made this and it was awesome! I LOVE every recipe of yours that I have tried. I was thinking, since it has no flour, if I found Gluten-free pretzels (at Aldi of course), I could do it an an option for some allergy people. What about substituting the butter for coconut oil, to make it dairy-free? Do you think this would work or do you have any other suggestions? I’d have to use vegan chocolate, too, I guess…. So glad you loved it Christy! Gluten-free pretzels would totally work, but I haven’t done any playing around with dairy alternatives and vegan chocolate, so I couldn’t speak to how well those would work. If you try it, let us know how it turns out! Just made 2 versions – one with regular pretzels and one with GF pretzels. Also added a thin layer of salted caramel between crust and cake. Looking forward to eating tomorrow in celebration of a coworker’s birthday. I made this for my cousin’s baby shower and I was little nervous at first because I am not a big baker. It took a little longer than I expected to cook (that might just be my oven) but when I set it out with the other desserts at the shower I couldn’t believe how fast it disappeared! Everyone was raving about how delicious it was and asking me for the recipe. The thing I did differently was I used half dark chocolate and half semi sweet chocolate. The only thing I wish I had known as a novice baker was to put a cookie sheet underneath my spring pan because a lot of the butter fell down into my oven and ended up catching on fire…luckily no real damage done but still a little scary. All in all I can’t wait to make this again!! Just put this in the oven and realized I forgot to put the butter in with the melted chocolate! F*&(*@# … I hope it comes out okay!